Tudor is a brand that carries two great names: The one of the British dynasty and the one of Rolex, which created it as a sub brand. The idea behind Tudor is simple and powerful: To create watches that are cheaper than Rolexes, but have the same level of quality and reliability. More than two decades after Rolex was founded, its company founder Hans Wilsdorf realized an idea that he had been thinking about for already a long time: He wanted to make watches that would be less expensive than Rolex, but as robust and reliable. Instead of incorporating these watches into the regular Rolex assortment, he created a subsidiary brand with an own name. As he was enthusiastic about life throughout England, he named the company after one the most famous British royal house of all time - The House of Tudor. Until the end of the 60s, therefore, a stylized rose was shown as a reference to the coat of arms of the royal house on every Tudor watch, after which it was replaced by the now known heraldic shield. Production initially began with Rolex enclosures, which were equipped with lower-priced supplier movements from ETA or Valjoux. Among the most popular models was the Tudor Submariner, which was based on the eponymous Rolex classic. It lived up to Rolex's quality standards so much that it was used by the French Navy for decades. 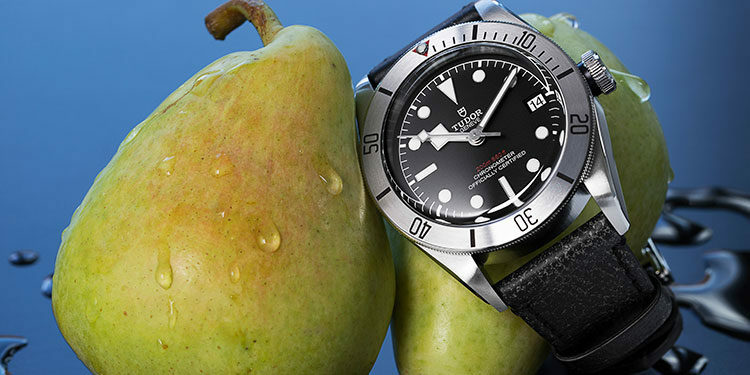 For their divers Tudor developed with the Pelagos LHD a watch especially for left-handers. The winding crown is mounted on the left side so it can be worn ergonomically right on the right hand. Tudor celebrated initial success with its own designs when the company released a range of sporty chronograph models with distinctive color combinations. 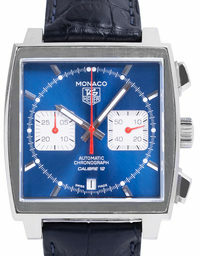 The most successful model was the Monte Carlo from 1974, which was reissued in the Heritage Chronograph series. Even today, the Tudor assortment is divided in two: timeless classic models in the style of Rolex stand alongside dynamic sports models that draw attention to each other with expressive colors. Many of Tudor's most popular watches are heritage editions that pick up on the most successful designs from Tudor history and combine them with cutting-edge technology. The fact that this strategy is more than just nostalgic shows the increasing popularity of the Swiss brand. For a long time Tudor produced wristwatches that visually differed only minimally from the models of Rolex. After several decades, the brand began to develop its own design language, which is characterized by sportier and more striking characteristics than the classic discreet Rolex style. One of the features is the use of strong colors that give the models of Tudor a dynamic touch. In addition, Tudor likes to use playful forms such as the famous "snowflake" hands or shield-shaped indices, which clearly emphasize the fresh flair of the watches. A style that catches your eye without being pompous or pretentious. Tudor also makes some series that have remained true to the timeless and classic Rolex style, but without copying it, such as the Classic Collection and the Style series. Numerous watch connoisseurs all over the world already appreciate the robustness and outstanding functionality of the Tudor watches. Especially the legendary "Tudor Submariner" was very popular among soldiers of the naval forces around the globe and was used by the French Navy National, the Jamaican Defense Force, the Canadian Navy and the US Navy. Lady Gaga not only breaks taboos in the music world and lives her celebrity status as an art form. Nothing is left to chance in their outfits - every accessory is a statement. In the video she wears the Tudor Heritage Black Bay, whose red bezel stands out prominently. Football star David Beckham is another face of the campaign. Beckham, who dreamed of becoming a footballer from childhood, followed his dream, always ready to give everything and cross his own borders. He does not have to compromise with the Tudor Black Bay S&G and combines quality with comfort. In our online shop you´ll find different Tudor models, vintage and used in excellent condition. 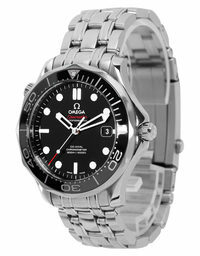 Tested and certified by us in-house, we guarantee original Tudor watches at prices often below the general market value. Buying a used luxury watch from Tudor can also be worthwhile as an investment. 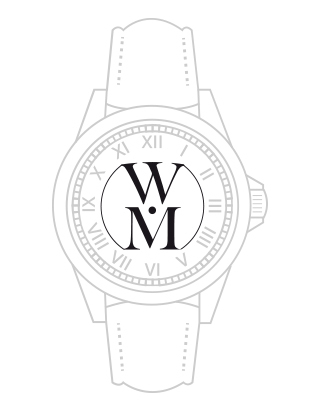 Watches from major brands in most cases experience a constant increase in value over the years. Models such as the Pelagos show an increase in the resale price over a short period of time, which is noticeable: Between 2012 and 2016, their price alone rose from € 3,250 to € 4,110. When Rolex was founded, mechanical wristwatches were far from being seen as luxury items. 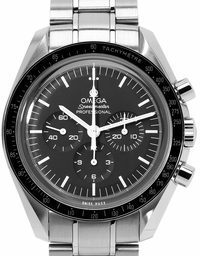 Quartz watches and cell phones were unthinkable at the time, so almost every man wore a watch for everyday use on his arm. 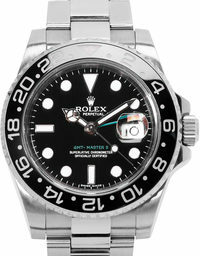 Rolex watches are therefore designed to withstand all the stresses of everyday life. The superior quality that Rolex pursued also meant in practice to make the watches durable enough for manual jobs such as construction and steel foundries. At the same time, the purchase of such a watch was often too expensive, so that especially groups of people who needed them most needed, often could not afford them. For a long time, Hans Wilsdorf, the founder of Rolex, was thinking of creating a production line that could be "sold at a lower price than our Rolex, which is just as reliable." With Tudor he finally realized this idea. 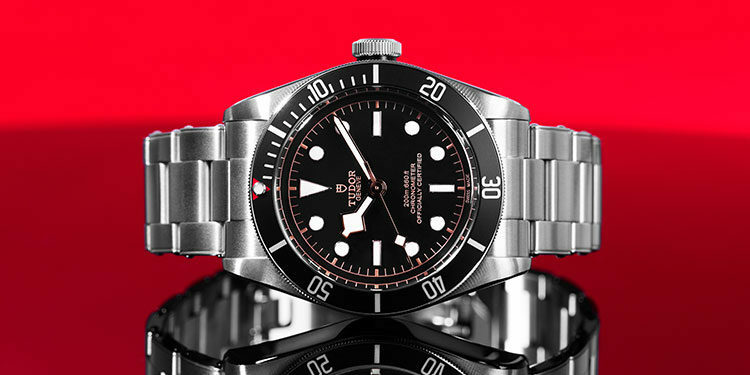 The brand's focus today is on quality, functionality and cost efficiency: Tudor watches are less prestigious than Rolex models, but offer the same high quality at a significant lower price. Usally they are appreciated and bought by watch enthusiasts and people who find Rolex's enormous reputation distracting. With the new campaign #borntodare Tudor emphasizes that one is ready to take other paths, to test unusual materials, simply to risk something new. By combining well-proven designs and new technologies, the brand has always sought to transcend itself and take alternative opportunities. In keeping with this, the new campaign is aimed primarily at those who face their challenges on a daily basis and do not shy away from adventures. 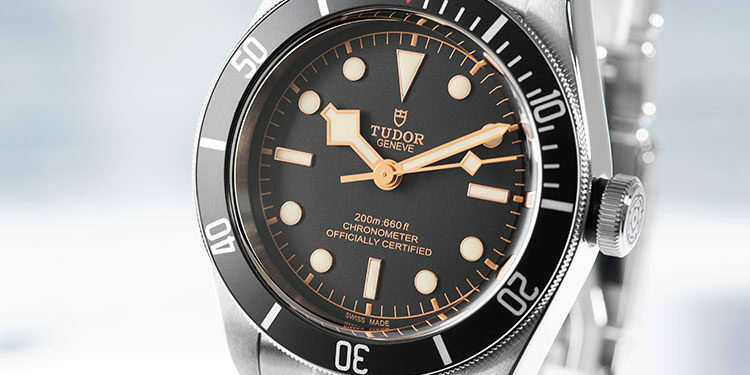 The Tudor Heritage Black Bay is a reissue of the Submariner, Tudor's first diver's watch from 1954. 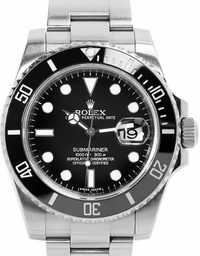 The great similarity to the eponymous Rolex model is no coincidence, as the Submariner was designed as a lower priced version of the most iconic diver's watch of all time. Since 2016, the Black Bay series is equipped with completely custom-made movements from Tudor. 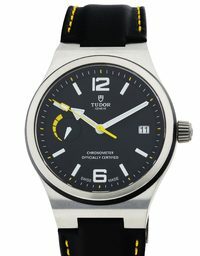 The Tudor North Flag is a dynamic and stylish sports watch, which also has an in-house movement.. The naming was inspired by a British Greenlandic expedition in the 1950s, where Tudor watches were used. 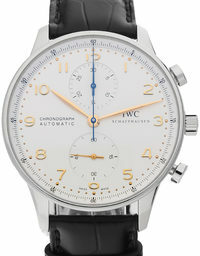 The impressive power reserve of up to 70 hours can be read on the power reserve indicator. 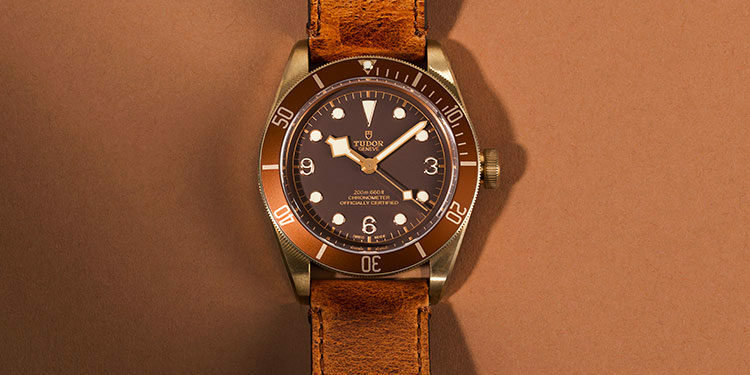 Tudor Pelagos - named after the Greek word for "sea" - is a popular diver's watch from Tudor and was designed to explore the depths of the sea. 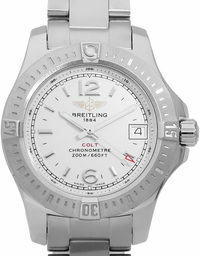 With a water resistance of 50 bar (500 meters), a rotating bezel and luminescent markings, it is a fully functional diver's watch that does not have to hide from models like the Omega Seamaster or the Breitling Superocean. The Tudor Fastrider Chronograph series was developed in 2011 in cooperation with the motorcycle manufacturer Ducati and is inspired by the enormous speed and dynamics of the Ducati Scrambler. The dials set in yellow, green or red a statement: The sporty series with Tachymeter convinced not only Ducati fans. The Tudor Grantour watches are also a recognized sports watch series with tachymeter function. As her name suggests, it is inspired by the racetrack and is considered as a tribute to motorsports. Tudor has been the official timekeeper of the WEC (World Endurance Championship) for many years and honors the collaboration with this series. Find a wide selection of used and vintage Tudor models in our online store. 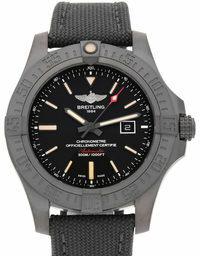 As a service, we check and certify all watches sold by us, we guarantee you authenticity and a safe purchase. 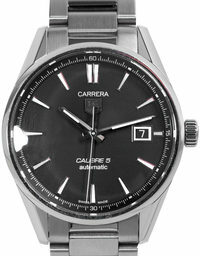 If you want your timepiece quickly, you can simply pay your Tudor watch by credit card. If you want to plan your investment long term, you can pay your disired model in convenient installments as financing. Financing a Tudor watch is often worth considering: in some cases, adding value can not only recoup the cost of financing, but can also outperform it in the long run. Find out on our website about which payment option is the right for you and buy your favourite Tudor Watch today. What is the Price of a Tudor?